We can go on forever about their skills as musicians, singers and songwriters. We can talk about their deep love and understanding of bluegrass music Or we can make it easy and say that Sweden's The Original Five is a world class bluegrass band. 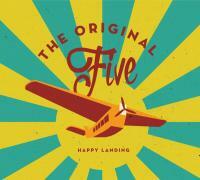 The Original Five was a highly accomplished band already on the album debut »Greetings From Möllevången« from 2014. Since then they developed further by playing live, at home i Sweden and at international bluegrass festivals in Europe and in the USA. 2015 they released the second album »Across The Deep Blue Sea«, with a focus on their songwriting skills. An art they take even closer to perfection on the new album »Happy Landing«. 8 of the 11 songs are originals, but in a the bluegrass tradition, they include three covers, as a nod to their predecessors. We get great versions of Earl Scruggs and Lester Flatt's »Fireball«, Merle Haggard's »Old Man From The Mountain« and the more obscure Jim McCall song »A Rambler and A Rover«.